"Southern comfort in the form of a cookie." Grind the nuts with 1/2 cup flour in a food processor. Pulse on and off till the nuts are ground to a fine crumb. Add the rest of the flour and the cornstarch. Pulse to mix. In a separate bowl, cream the butter or margarine. Mix in the confectioners' sugar, vanilla, and bourbon. Work in the flour mixture. Knead the dough until smooth. Lightly spray your shortbread pan, or an 8 inch round pan, with a vegetable oil spray. Firmly press the dough into the pan, working from the center out. 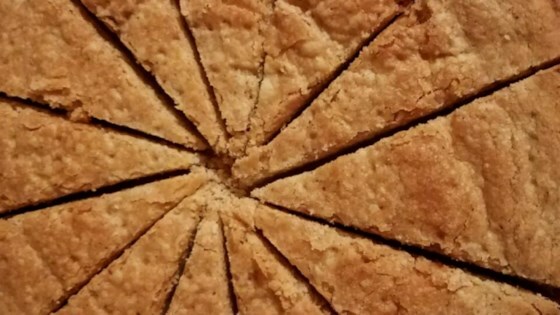 Poke the shortbread all over with a fork. Bake at 325 degrees F (165 degrees C) for 35 minutes, or till lightly browned. Let cool for 10 minutes in the pan. Loosen the edges with a knife, and flip the pan over onto a cutting board. Tap lightly to loosen from pan. Cut into serving pieces while still warm. YUCK!! Maybe I did something wrong...It didn't taste that great and too dry! Hubby wouldn't touch it! This had a very delicate crumb. I couldn't taste the bourbon. I like the concept but may try Frangelico or Amaretto next time. Great flavor, even without the bourbon! I didn't have bourbon and my husband thought scotch would be too different, so I substituted 1T water for the bourbon. Can't wait to also try bourbon! I’ve made these several times. I double the pecans and use brown sugar instead of powdered sugar. Great flavor. Come out of the pan beautifully. You can use bourbon or vanilla. Delicious!